As we mentioned yesterday, with the end of the year comes reflection and reminiscing on the high and low moments, lending a time to reset and plan fresh beginning for the 12 months ahead. In fashion, an annual reflection means combing through data to find the most popular T-shirt of the year, the new fashion poses trending on Instagram, and the trends that flunked and dominated. Today we’re narrowing in on the denim department and highlighting the top-selling skinny jeans in 2018. Thanks to insight from our in-house affiliate team, we’ve gathered the 11 pairs of jeans that our readers dubbed the most wearable. After looking through the section of skinny jeans, we noticed one style missing from the bunch: light-wash jeans. We’re referring to skinny jeans with a super-duper light wash, not to be confused with a vintage-inspired wash. Although there’s a bit of variety in terms of styles and silhouettes, the least popular skinny-jean style of the year goes to light-wash denim. The styles that made our list all have a high-rise waistline and are slightly on the cropped side rather than full-length and bunched at the ankle. Below you’ll find the skinny jeans ranked from the 11th slot to the number one style (can you guess the brand?) of the year. 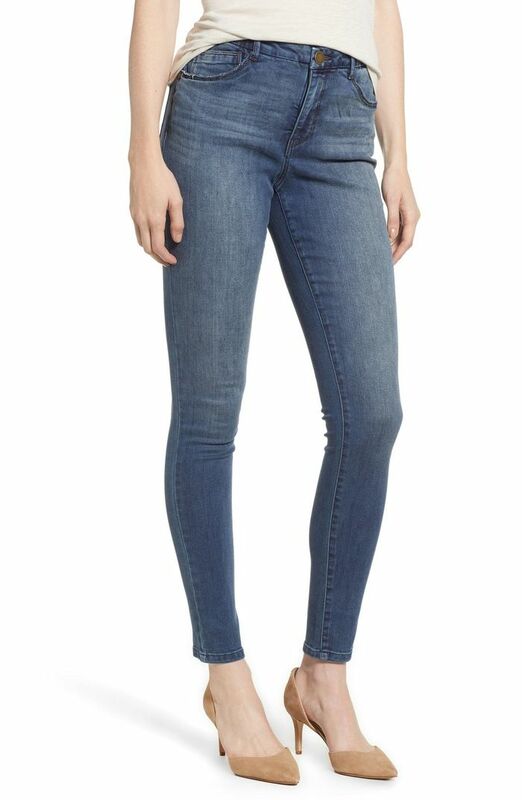 Scroll down to see and shop the most popular skinny jeans. Such a great price ringing in under $70. This style also comes in several other washes. A nice cropped ankle with a subtle frayed edge. You can't go wrong with a high-rise option. A deep dark denim never disappoints. Topshop is known for its affordable and on-trend denim selection. These Paige jeans come with rave customer reviews. Our in-house celebrity stylist swears by these skinny jeans. The top-selling jeans of the year right here. Loose and relaxed is the theme for 2019. A budget-friendly way to test out the denim trend. Subtle distressing always lends a laidback look. We're dying to try this pair from Re/Done. Another affordable way to try the trend. These jeans are always earning street credit in NYC. Give your true black jeans a rest and opt for a washed black option. You'll get so much wear out of this simple style. We love the side-stripe detail here. Up next, see the "boring" skinny-jean style celebs are bringing back.